Long before Jews in Tilsit (since 1945, Sovetzk) acquired citizens’ rights in the 19th century, large numbers of Jewish merchants were already trading in the city. Some came over the national border 20 km north of the city, others sailed in on the countless wooden rafts that travelled along the River Neman from Lithuania and Belarus. The Jewish community, which established itself from around 1812, was not allowed to build a synagogue until 1842, and by 1910 the number of members had gradually risen to no more than about 650. Between 1880 and 1910 Tilsit was an important stop-off point for Jews heading overseas from the Russian Empire. After the signing of the Treaty of Versailles, when the Neman became a border river, the small cosmopolitan city of Tilsit lay on the border between two nations. 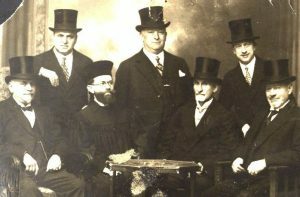 In the 1930s, much of the Jewish community, particularly younger members, began leaving the city to find a new life abroad, settling in South Africa and the United States, but also in Shanghai and Lithuania. The rest of the city’s Jews were deported in August 1942. 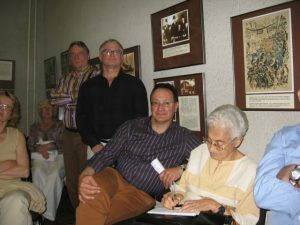 2009 Descendants of former Jewish citizens at the opening session of the exhibition Jews in Tilsit (now Sovetsk, Russia). In many German cities, there have long since been reminders of the history of the Jews in forms of commemorative plaques and “Stolpersteine” Hardly anyone remembered the Tilsit Jews. The former citizens were scattered to many different places after the Second World War, the inhabitants of Sovetsk today knew nothing about the Jewish history of the city. Now, for the first time, with active help from the descendants of the Jews of the region, it is shown what role the city played in each family history. 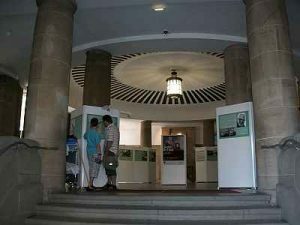 The initiative came especially from the Sovetsk City Museum, which requested an exhibition about Jewish life. 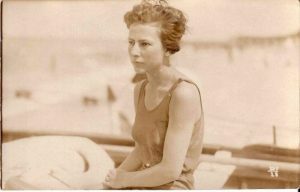 Many thanks are due to the descendants of families, who shared their family memories and submitted photographs. 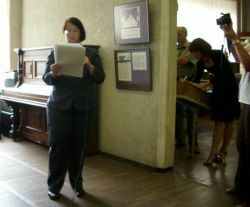 The exhibition was opened in summer 2009 in the Sovetsk City Museum. Thus, the Jews returned to the city’s history after almost 60 years. With this exhibition in the partner city of Kiel, a bridge is being built to the German state of Schleswig-Holstein and to all of Germany, which is interesting not only to those who have a Jewish background. Before the Second World War, Tilsit was one of the most north-eastern cities of the German Reich – near the Memel River, in the province East Prussia. Today, this city is called Sovetsk and belongs to the Kaliningrad area of the Russian Federation. 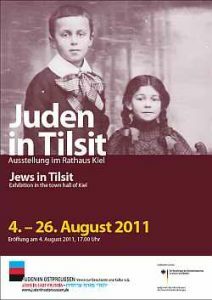 Mostly Germans lived in Tilsit, among them Lithuanians and Jews. The city lived from wood trade on the Memel. Because of its position, its size and the frequent fairs, in the past, it was a favourite destination of merchants and buyers that came from across the border. Among them were many Lithuanian Jews (Litvaks), who traded with the East. While the image of Jews was influenced especially by merchants from Poland and Lithuania before 1812, this profile was changed by the Prussian tolerance edict with the arrival of west Prussian Jews. Around 1820, Jews from West Prussian heritage were dominant. In 1825, a Jewish graveyard was built. Still in the same year, the community bought land for building a synagogue, the purchasing of which was permitted by the cabinet. However, the petition to build was denied by King Friedrich Wilhelm III in 1826, and it took nearly two decades until synagogue construction could finally begin in 1842. With the beginning of the Crimean War in 1853, the situation of the Prussian-Lithuanian border changed radically. With exception of Prussia, Russian trade was boycotted from all sides in 1853-56. Now the tsarist government was forced to lift the ban on border traffic to Prussia. All imports were led over land, especially through Tilsit. This way, a politically undesired but economically forced liberalisation of border law took place. Trade earned fantastic income. The years went down in local history as „golden“. The liberalisation of border law led to relief for the Jewish population. Especially Litvaks moved into the city. During the entire 19th century, the number of Jewish citizens grew, until it reached a total of 650 people (of a total amount of 37.000 inhabitants) in 1910. 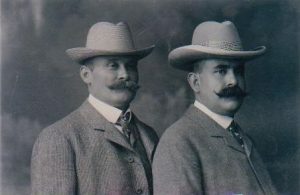 Since 1885, Tilsit played an important role as a city of thoroughfare for Jewish emigration from the Tsarist Empire to America and South Africa. Thousands of Jews from Lithuania, Latvia and Belorussia spent several days of their journey in the city, were examined medically, received foodstuffs as well as their ship tickets. After the Peace of Versailles (1919) the Memel River became a border river. The liberal little trade city became a national border city. The political viewpoints and contrasts became stronger. Especially the young Jewish population left the city and emigrated in the 1930s. They went to South Africa, the United States, but also to Shanghai and Lithuania. 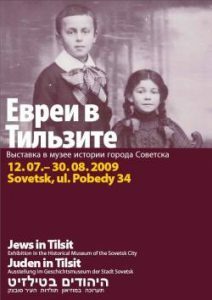 At the end of August 1941 there were still more than 300 Jews in Tilsit. On June 24th, 1942, they were deported to the area near Minsk and immediately shot: thus, the Jewish perspective vanished from the city. 2011 Rathaus (Town Hall). 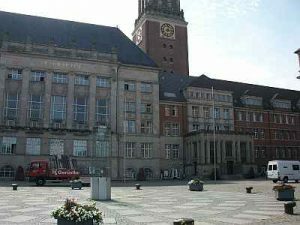 Kiel is the twin city of Sovetsk/Tilsit of today and the sponsor of Stadtgemeinschaft Tilsit e.V.